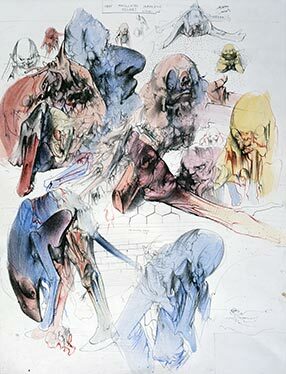 Untitled, 1974, ink and watercolor on paper, 45 × 65 cm. 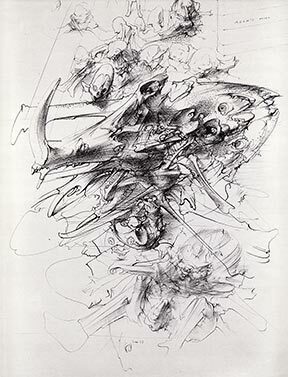 Untitled, 1973, ink on paper, 74 × 107 cm. 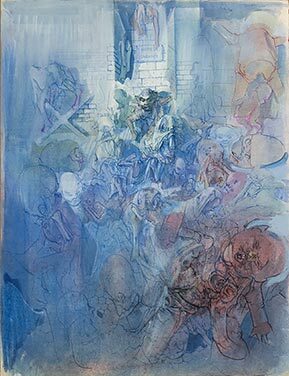 Les Anges Lures, 1971, ink and watercolor on paper, 75 × 105 cm. 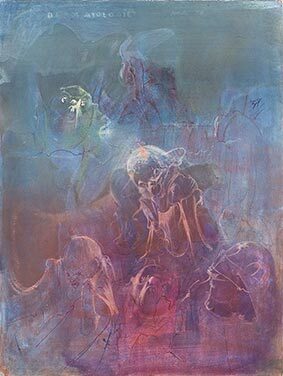 Igor Burazin collection, Lisbon. 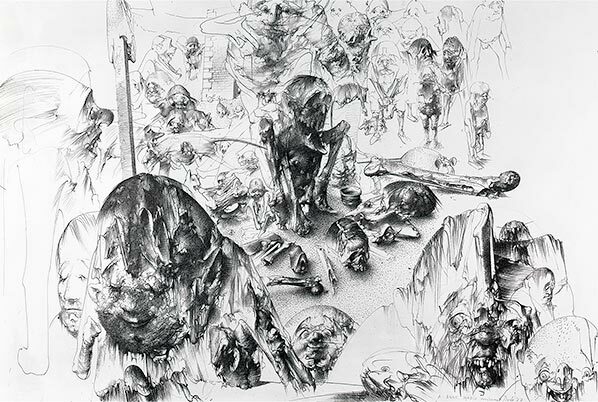 Memories from the underground war, 1971, ink on paper, 90 × 150 cm. Françoise and Germain Viatte collection. Photo: Pascal Szidon. 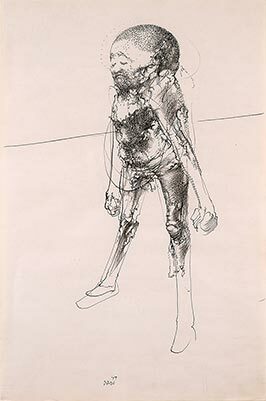 Untitled, 1970, ink on paper, 50 × 65 cm. Nenad Erić collection. 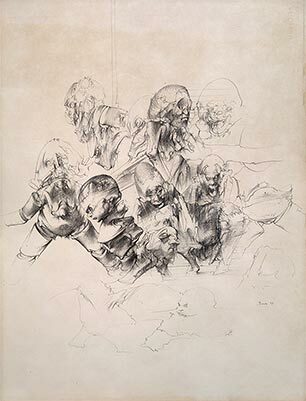 Untitled, 1970, ink on paper, 54 × 66 cm. © Centre Pompidou, Mnam-Cci, Bibliothèque Kandinsky, Paris. Photo: Jacques Faujour. 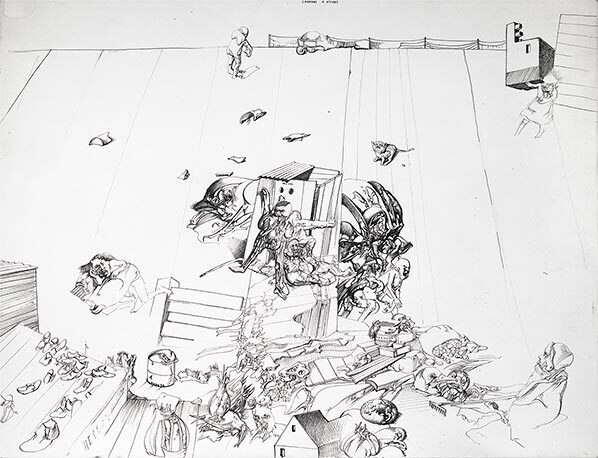 The Toolshed, 1970, ink on paper, 50 × 64,5 cm. 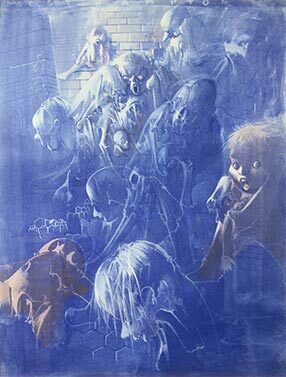 To the City of Saint-Denis I, 1974, India ink mounted on wood, 105,5 × 150 cm. 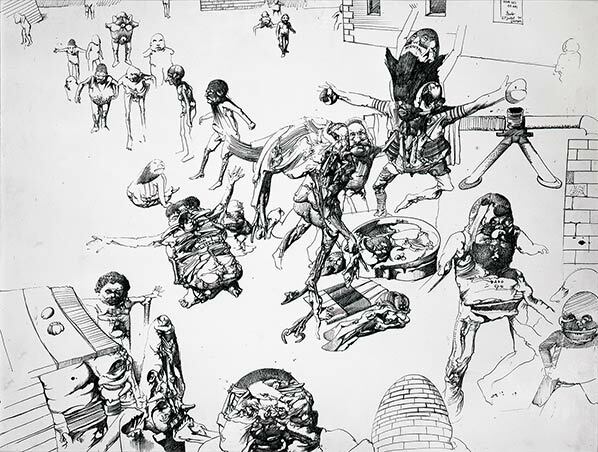 To the City of Saint-Denis II, 1974, India ink mounted on wood, 105,5 × 150 cm. 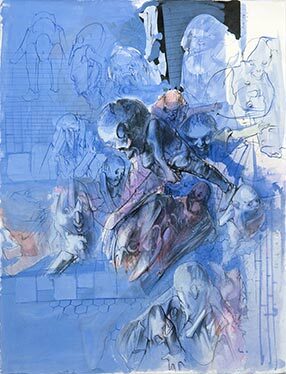 Frida, 1973, India ink and colored pencil on paper, 74 × 107 cm. 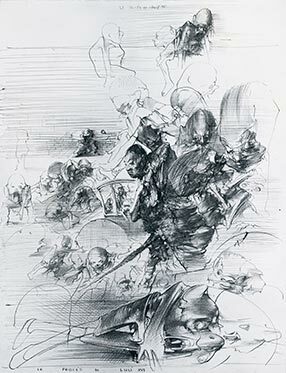 Untitled, 1976-1977, ink on paper, 55,5 × 73 cm. 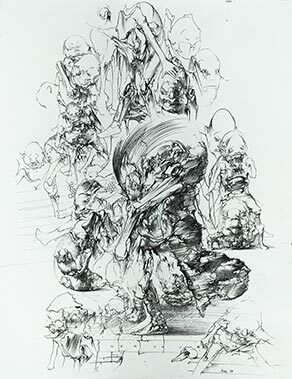 Untitled, 1977, ink on paper, 72 × 107 cm. 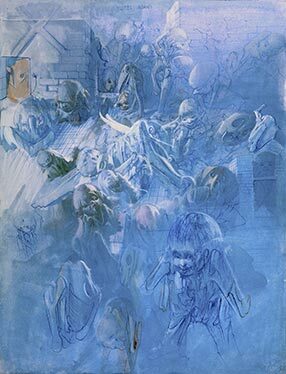 Hospital, 1979, pencil on paper, 75 × 108 cm. 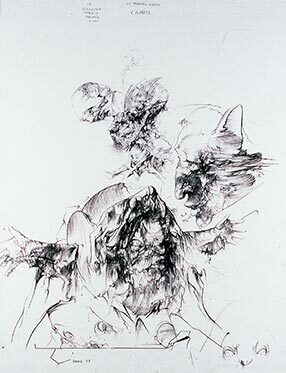 Oaths III, 1974, ink on paper. Oaths. 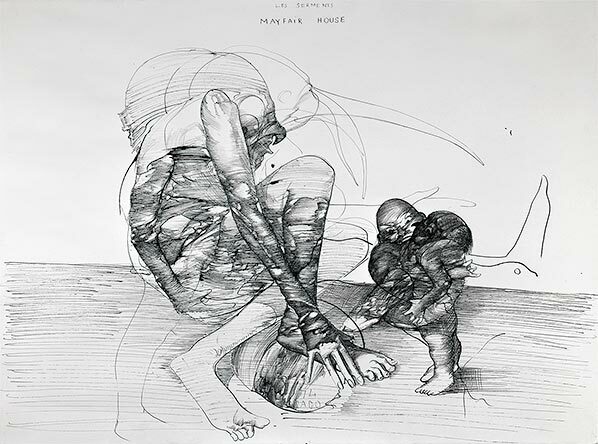 Mayfair House, 1974, ink on paper. 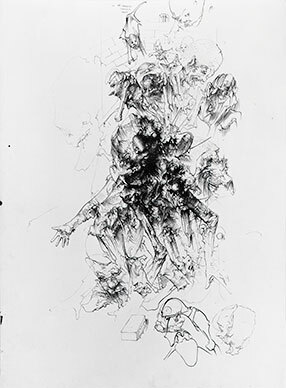 Left: Untitled, 1977, ink on paper, 65 × 50 cm. 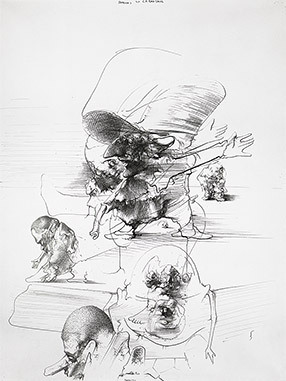 Right: Let us dance the Carmagnole, 1977, ink on paper, 65 × 50 cm. 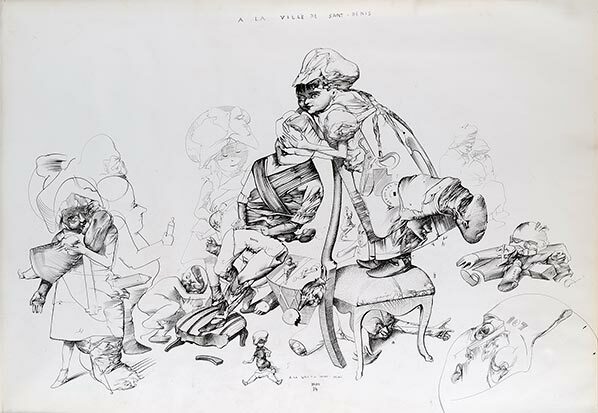 Left: Trial of Louis XVI, 1977, ink on paper, 65 × 50 cm. Courtesy Archives Brachot. 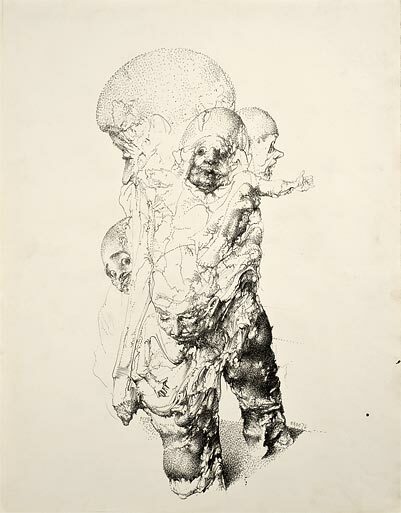 Right: Carrier, la tragédie nantaise, 1977, ink on paper, 65 × 50 cm. © Centre Pompidou, Mnam-Cci, Bibliothèque Kandinsky, Paris. Photo: Béatrice Hatala. 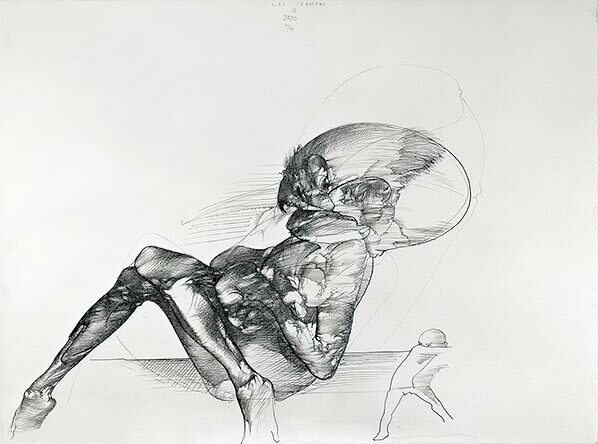 Left: Carrier, 1977, ink on paper, 76 × 56 cm. 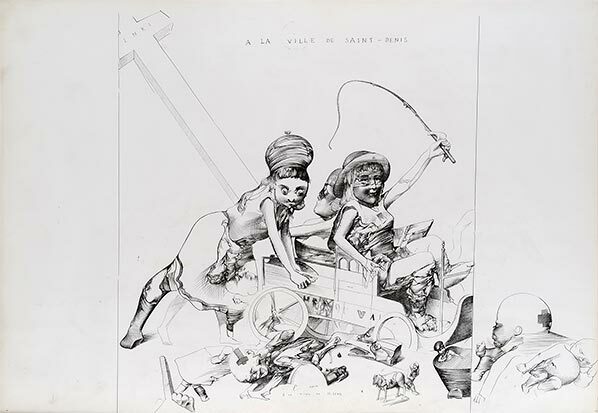 Right: The French Revolution, 1977, ink on paper, 76 × 56 cm. Courtesy Archives Brachot. 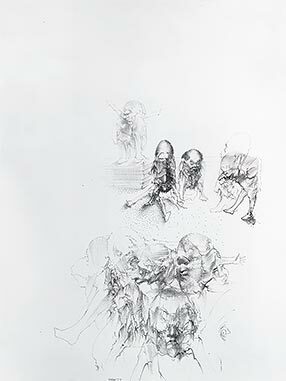 Left: Untitled, 1974, ink on paper, 65 × 50 cm. 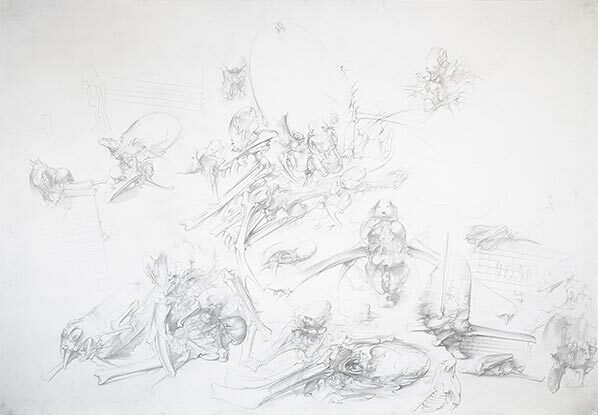 Right: Warthog skull, 1978, ink on paper, 66 × 50,5 cm. → See first state (Courtesy Archives Brachot). 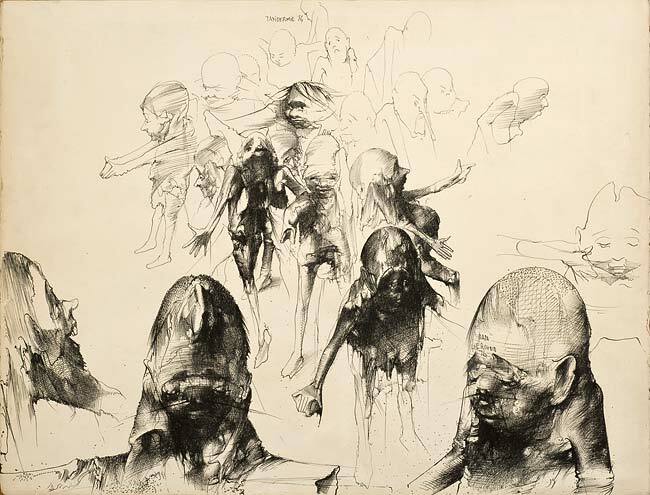 Left: Tribute to Fahlström, 1976, ink and ink wash on paper, 64,53 × 49,5 cm. 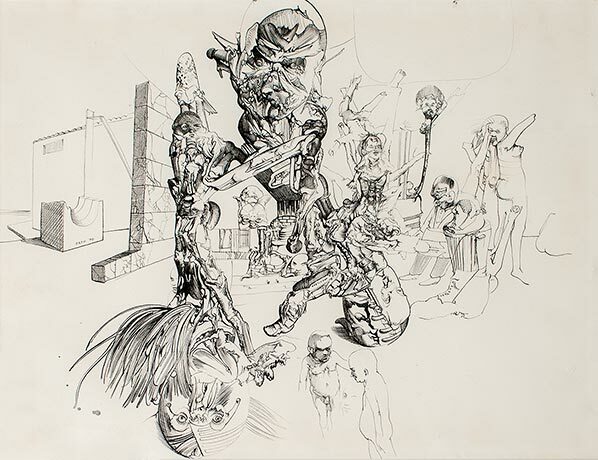 Right: Tribute to Fahlström, 1976, ink on paper, 106 × 73,5 cm. 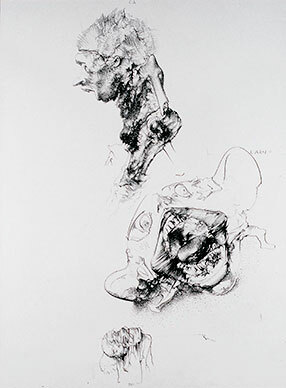 Left: Untitled, 1977, ink on paper, 76 × 56 cm. Courtesy Archives Brachot. 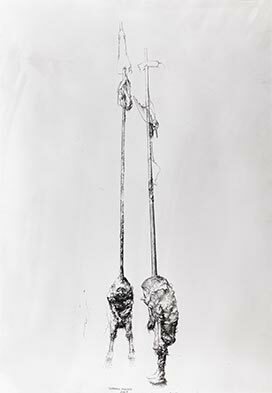 Right: Untitled, 1978, ink on paper, 65,5 × 50,5 cm. Courtesy Archives Brachot. 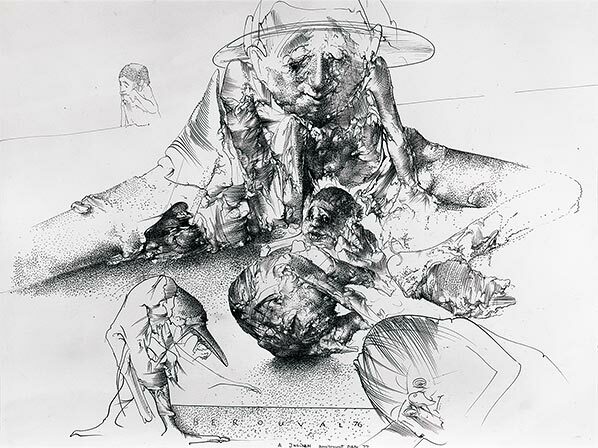 Hérouval, Taxidermy, 1976, ink on paper, 50,5 × 66 cm. 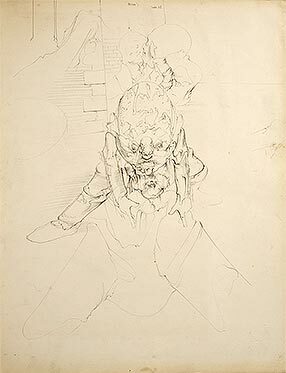 Left: Adam’s, 1978, pencil on paper, 66 × 50 cm. 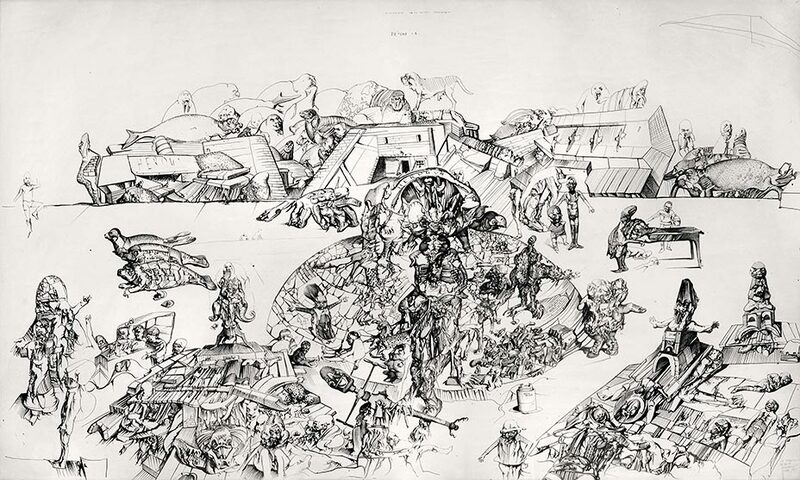 Right: Untitled, 1974, ink on paper, 200 × 150 cm. 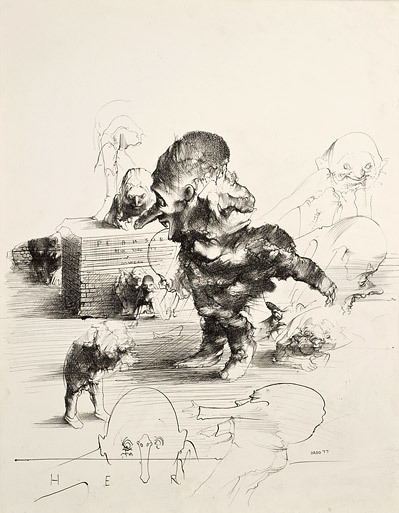 Left: The Revisor, 1977, ink on paper, 65 × 50 cm. 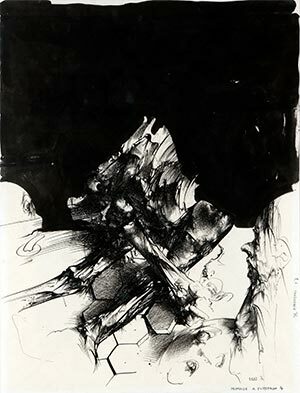 Right: Untitled, 1976, ink on paper, 65,5 × 51 cm. 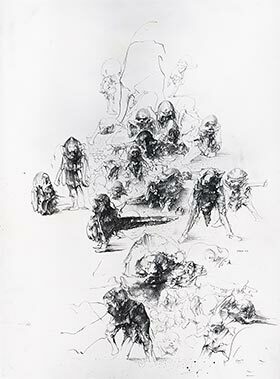 Left: Untitled, 1977, ink on paper, 45 × 30 cm. 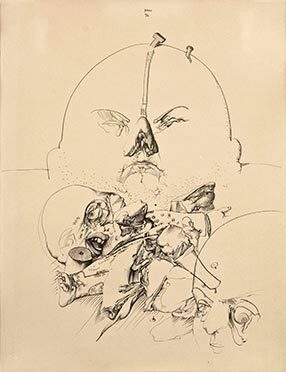 Right: Untitled, 1977, ink on paper, 63 × 48 cm. Photo: Pascal Szidon. 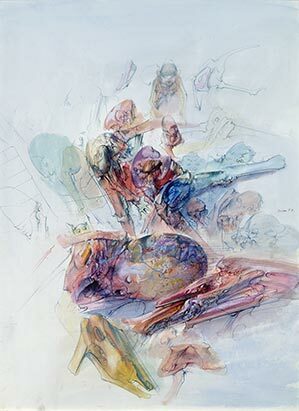 Montenegro, 1976, ink and watercolor on paper, 70 × 101 cm. Photo: Emmanuel Orion-Quelweb. 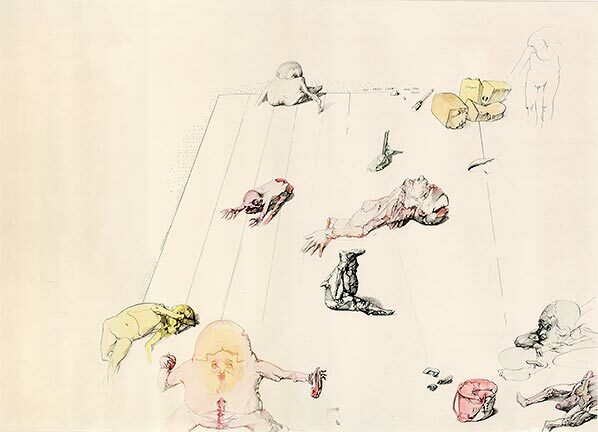 Left: Untitled, 1978, ink and watercolor on paper, 77 × 57 cm. Courtesy Archives Brachot. 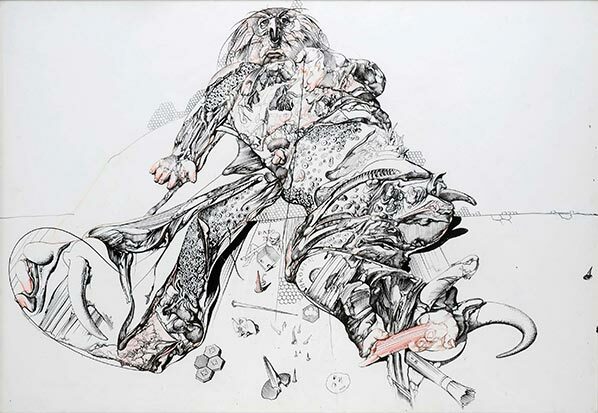 Right: Untitled, 1978, ink and watercolor on paper, 57 × 38 cm. Courtesy Archives Brachot. 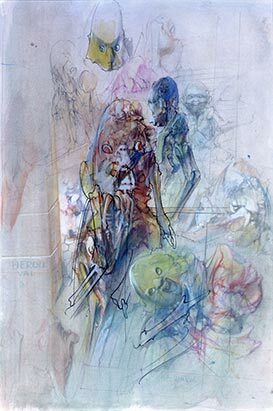 Adam’s diptych, 1978, ink and watercolor on paper, 66 × 50,5 cm. 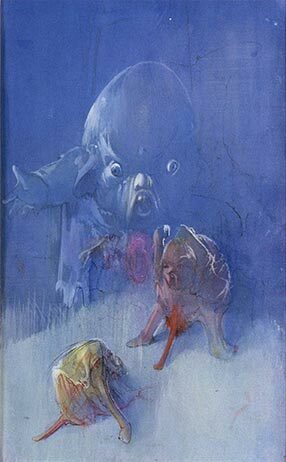 Courtesy Archives Brachot. 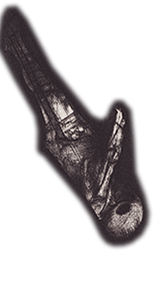 → See final state of the first panel. 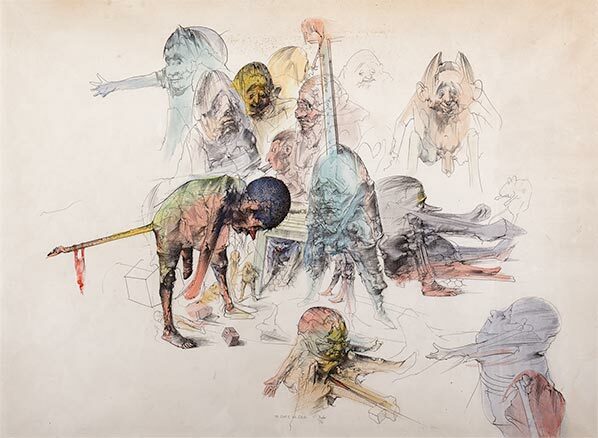 Left: Untitled, 1978, ink and watercolor on paper, 66 × 50,5 cm. Courtesy Archives Brachot. 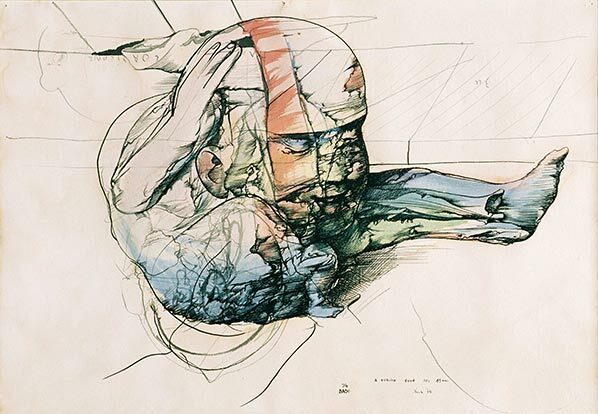 Right: Untitled, 1978, ink and watercolor on paper, 66 × 50,5 cm. 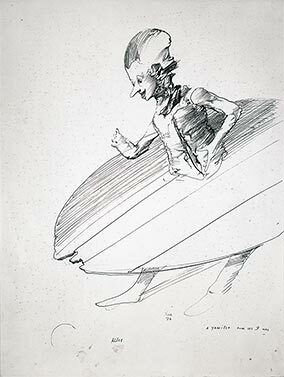 Courtesy Archives Brachot. Left: Dermatology, 1978, gouache on paper, 65,5 × 50 cm. 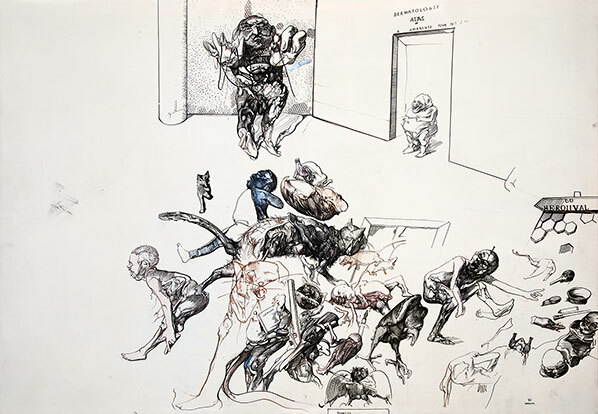 Right: Hotel Adam’s, 1978, ink and watercolor on paper, 65,5 × 50 cm. 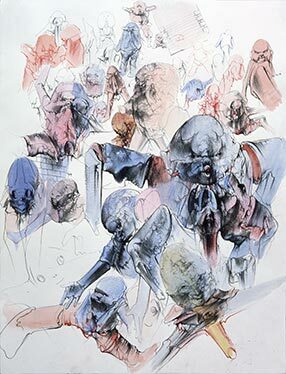 Left: Westhampton, 1978, ink and watercolor on paper, 64 × 49 cm. 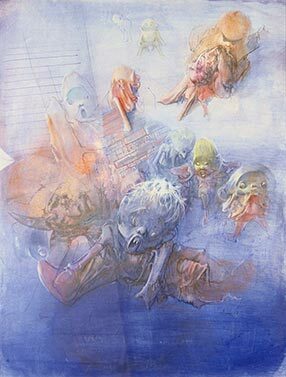 Right: Westhampton, 1978, ink and watercolor on paper. 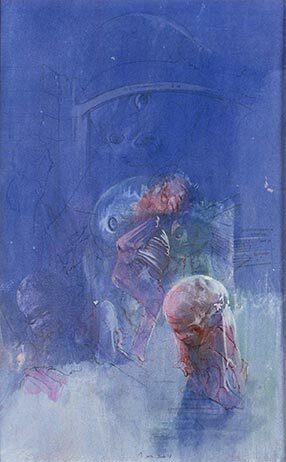 Westhampton diptych, 1978, ink and watercolor on paper, 54 × 68 cm. 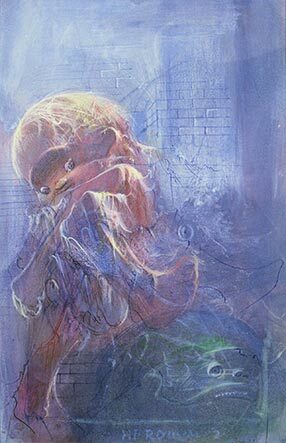 Left: Untitled, 1978, ink and watercolor on paper. 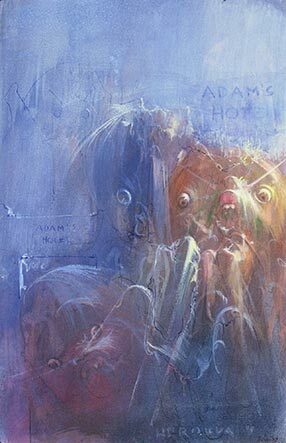 Right: Adam’s hotel, 1978, ink and watercolor on paper.